Protect your home or business during power outages with the #1 selling home standby generator in the U.S. and Canada by installing a Generac Generator. Skyview Electric Inc. is an authorized Generac Generator Dealer and has Generac Certified and Factory Trained Installers. When the power goes out, you can count on Generac to work for you. A Generac Home Standby Generator senses a power outage, turns on automatically and delivers back-up power to your home. It will run until utility power returns—whether that’s two hours or two weeks. An Automatic Transfer Switch is installed allowing Standby Generators to operate automatically without homeowner involvement. A small generator (i.e. 8kw) with a limited circuit panel and selection of a few necessary circuits. A larger generator (i.e. 20 kw) with a whole-house transfer switch that will run everything. A Generac sizing tool is used to help homeowners decide which generator best fits your home. 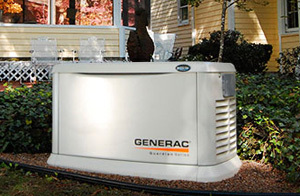 Home Standby Generators operate on either natural gas or LP gas. Our technicians are Counter-Strike Gas Pipe Certified Installers and can install the required gas piping.